What the heck IS coral, anyway? Like the mollusks that build their clam, oyster, conch, or mussel shells, corals are animals that "build" their own homes. The coral reefs we know are formed of layers of calcium carbonate from the skeletons of many generations and millions of these individual animals. While reefs aren't exactly mobile like a clam with its shell, they expand as more and more coral polyps (the animals) live, grow, build, and die on top of the existing structure. But how does the process start? As anywhere, it starts with the youth, those crazy kids, breaking away and finding their place in the (underwater) world. Coral larvae are actually free-swimming critters that eventually find their place, attaching to existing reefs, submerged rocks, or other hard surfaces off the shores of islands or continents. 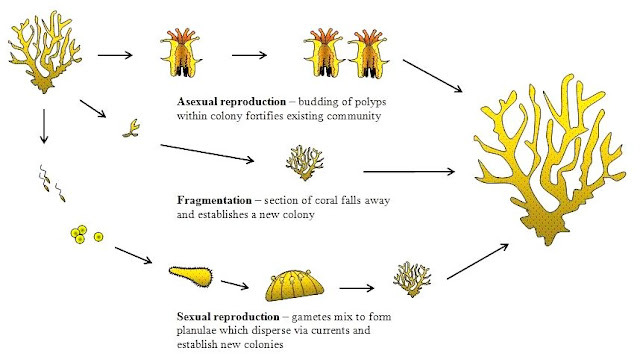 Once the planulae find a spot to call home, they stay put and transform into coral polyps, the adults. Coral polyps are related to anemones and look like upside-down jellyfish. The bodies of coral polyps are transparent and soft, so they take calcium and bicarbonate from the sea water and secrete calcium carbonate (CaCO3, a.k.a. limestone) to form an exoskeleton cup around themselves, which protects the soft, tiny, non-mobile animals from predators. It also happens to create a substrate for the next generation of incoming larvae. Over thousands of years, the skeletons of millions of additional animals, each just a couple of millimeters in diameter, form a coral reef. Each new living coral that attaches to the skeletons of its ancestors adds to the structure. made from millions of individual coral skeletons. You'll find most reefs in water that is shallow (~70m / 230 ft), clear, and relatively warm (70–85° F / 21–29° C), yet clear seawater has few nutrients to sustain the many thousands of living corals on a reef. 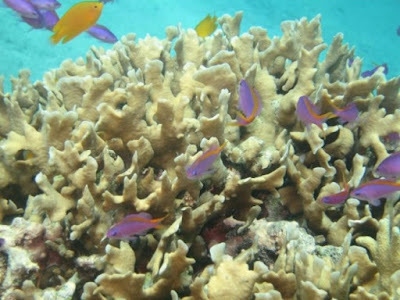 Corals thrive in these low-nutrient waters because they have help, in the form of tiny algae called zooxanthellae that have evolved to live inside the bodies of coral polyps. 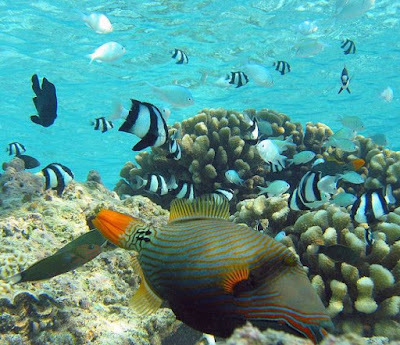 The corals' limestone skeleton protects the algae, and their metabolic waste products contain the compounds needed by the algae to produce food, through photosynthesis. These algae are plants, just like those on land, and they also need sunlight to photosynthesize, so they do best in the clear warm waters where little food is otherwise available. 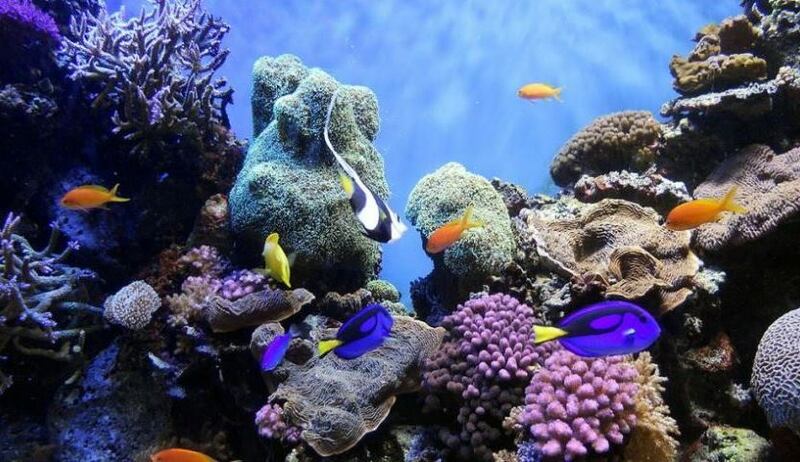 In return, the algae provide the coral with oxygen and food, predominantly carbohydrates, from which the corals manufacture fats and produce their calcium carbonate (CaCO3) skeletons. This win-win situation is called mutualism (a form of symbiosis). 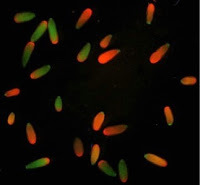 The zooxanthellae also produce pigments that give coral their color. Coral polyps actually have clear bodies, and the colors you see on the reef are those of the algae, plus some proteins inside the corals themselves that serve as a sunscreen. In general, more zooxanthellae and more sunlight lead corals to have more intense color. 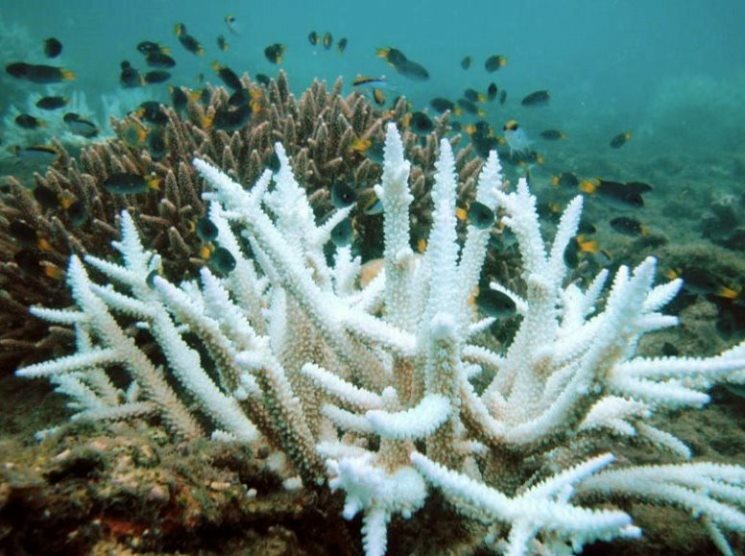 The problem for corals is that a) they can't produce enough food to feed themselves without the help of the zooxanthellae and b) they can't move around and find shade, or relocate their expelled algae. If the conditions return to normal relatively quickly, corals can regain their zooxanthellae and start producing food again. However, even the temporary food stress may reduce coral's growth and reproduction and increase its susceptibility to disease. 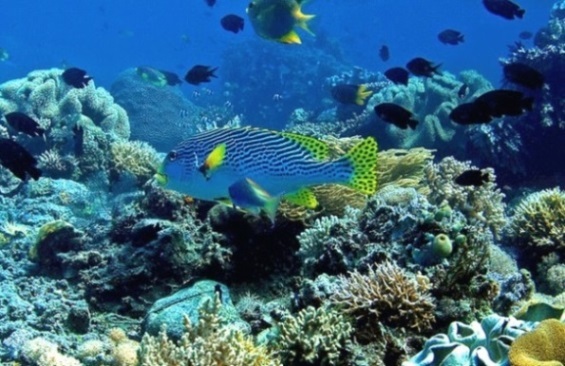 That's the danger to reefs from the warming oceans. In order to avoid intoxication from too much photosynthesis-produced oxygen, corals temporarily rid themselves of their source of food. You can guess how well that works after a bit of time -- "come baaack!" The eventually need the algae to return to produce sufficient food to survive. In sum, coral fitness depends on algae, which depend on warmth and sunlight. Yet too much of either puts algae into overdrive and can kill the coral. Warmer conditions will favor corals that can withstand higher amounts of oxygen in their systems and still survive and reproduce. The balance is sensitive, and we divers are lucky, we may start to see new coral communities dominated by those more tolerant species. Hi, thanks for sharing, interesting article. I once was lucky to visit the bottom of the ocean, near the Arctic. There is algae. I was surprised how they can live there. Here you can read http://poseidonexpeditions.com/blog/arctic-algae/. And if you have the courage and money, you can see it with your own eyes.